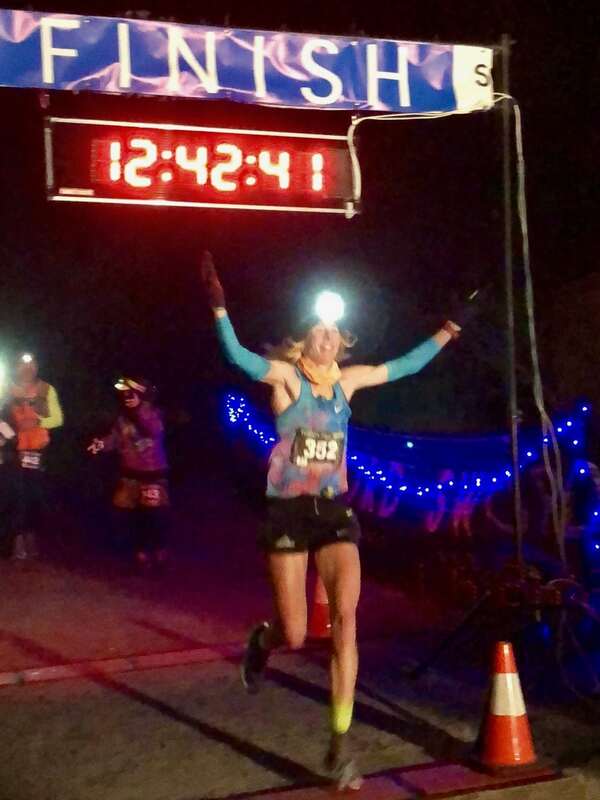 Camille Herron set a huge new 100-mile world record in 12:42:39 at the 2017 Tunnel Hill 100 Mile. That means she held an average pace of 7:38 minutes per mile for 100 miles. 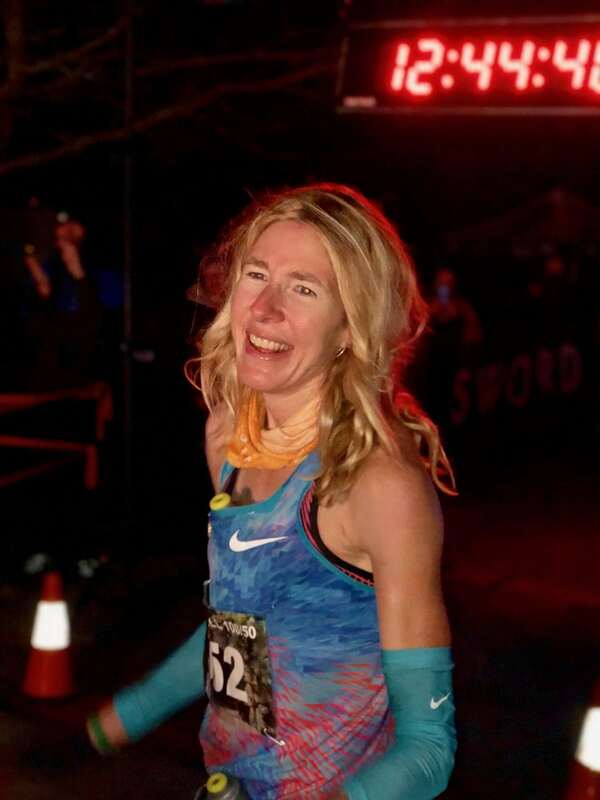 Her efforts bettered the previous record–set by Gina Slaby at the 2016 Desert Solstice track invitational in 13:45:49–by more than 63 minutes. In this interview, the 2017 Comrades Marathon champion talks about her last-minute decision to try for this record, how she determined her pacing plan ahead of the race, her in-race troubleshooting and nutrition, and what she’s setting her sights on in 2018. Camille Herron: I’m alright. I feel like a 14 year old boy right now. I’m eating everything in sight. Herron: I went into the race feeling really good. Nothing hurt. Oh my gosh, I just feel everything now. Even my arms hurt. How do my arms hurt? Holy cow. iRunFar: That’s a long time to be swinging your arms. Herron: Yeah, it was hard to get out of bed. iRunFar: Congratulations! You must feel so good today even though you feel so bad. Herron: Oh, man, it was incredible. I had a ballpark idea of what I wanted to hit. I wanted to break 13 hours, and then I thought if it was track or road, maybe I could go 12:20. I hit right in between there. I’m overjoyed. It was really enjoyable. It felt like an extended long run. I had it in my head that I was out for a long run, and I started with a couple people. The first five or six miles, I was running with other people and chit-chatting. I’ve been trying to do all these other mountainous-type races and trail runs, and this was just running—a pure, joyful long run. 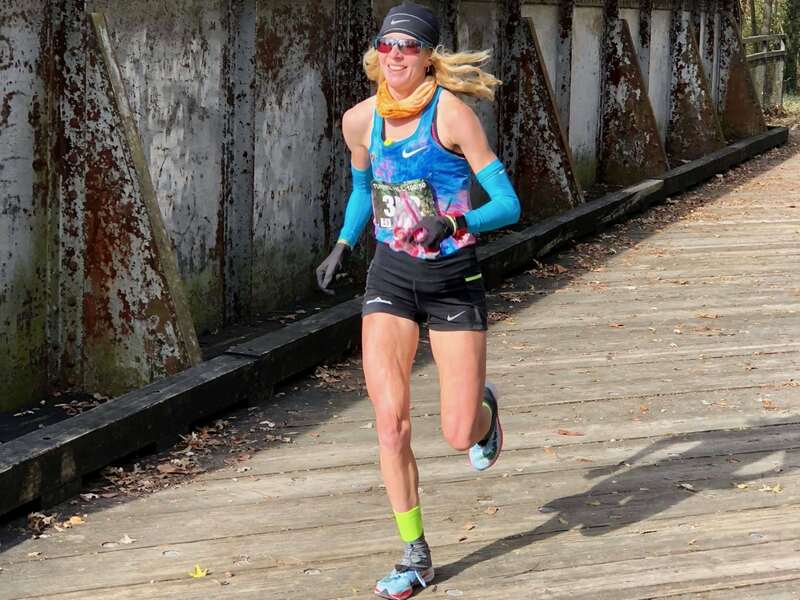 iRunFar: After experimenting outside of your wheelhouse, it was probably comforting to go back to a situation where you can set up splits and nail your splits pretty closely. Herron: Yeah, I go back and forth. I went to Comrades Marathon and got fast on the roads. I’d gotten back to training on roads leading up to that. Then I tried to do Western States and Leadville and that sort of stuff. To get back to pure running felt great. It’s been interesting and challenging to go back and forth between trail and road. This year I experimented with trying to do all of it. I remember running Tarawera, which was a very diverse course that started out with California-type trail running and then got kind of technical and then opened up into real running. I’ve thrown myself into a lot of different courses and situations, and had some goofy accidents and injuries. To get on a trail that is flat and runnable, I was just giving it. It was more my comfort zone. 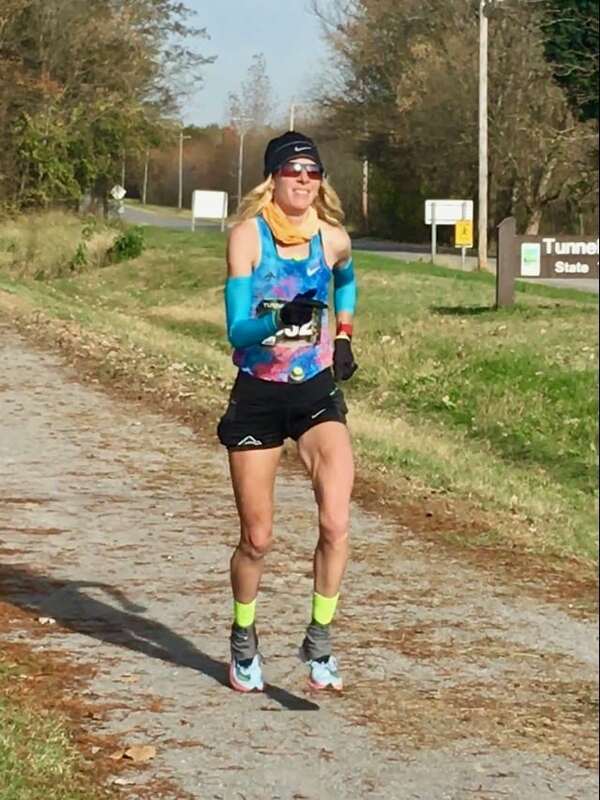 iRunFar: I want to ask how the Tunnel Hill 100 Mile got on your radar. It was only three weeks ago that you were at a fairly hilly race in France at Les Templiers. Herron: I wanted to get some European trail experience, and I had a very short build-up to that race because I hurt my hip at Leadville. I whacked my right hip out of place and had paralysis down my leg. I could not run, a nerve was pinched or something. I went 16 miles trying to shake it out. We had to troubleshoot that. I took two weeks off and then tried to get back to running. I had to start back with road running because we just weren’t sure, and I didn’t want to throw my hip off again. I had six weeks of training for Les Templiers, and I went down on the trails a couple times to push it on technical terrain. The thing is, my road legs were really coming back. I was feeling my speed come back. I went into Templiers not knowing how my body was going to feel. I felt really good there. It started to rain an hour into the race, and I’ve come to the conclusion that I do not stick. Like, my gait. We’re still trying to figure it out what is going on, but I think it’s my gait. I don’t think it’s anything about that I can’t run on technical terrain or I can’t climb or I can’t descend. If it starts to rain, I think it’s the way I run, my feet don’t plant or something. It’s happened every time it’s been wet or snowy or muddy. I’m so light on my feet that I don’t stick. It started to rain, and I literally flew off a ledge and hit a tree, and I think I broke something in my hand. They pulled me back up, and I got going again, and I felt like I wasn’t all there, like maybe I had a concussion. Fortunately I was okay, but it didn’t work out. How I got to Tunnel Hill… We went to Ireland the week after Les Templiers and I got back to training, and I felt really good. We were getting ready to leave the Dublin Airport, and I remembered Tunnel Hill and I was curious when it was. I looked it up, and it was coming up. I saw it was USATF certified. I didn’t think trail courses were certified. I knew there had been some fast times there, so I was really curious. Registration closed the next day. We were about to board a plane, and I told Conor [Holt], “You know the race director. Ask him about it.” I signed up for it a week and a half ago. We watched the weather, hoping nothing crazy happened. Herron: Yeah. We had to make sure they had all the paperwork. 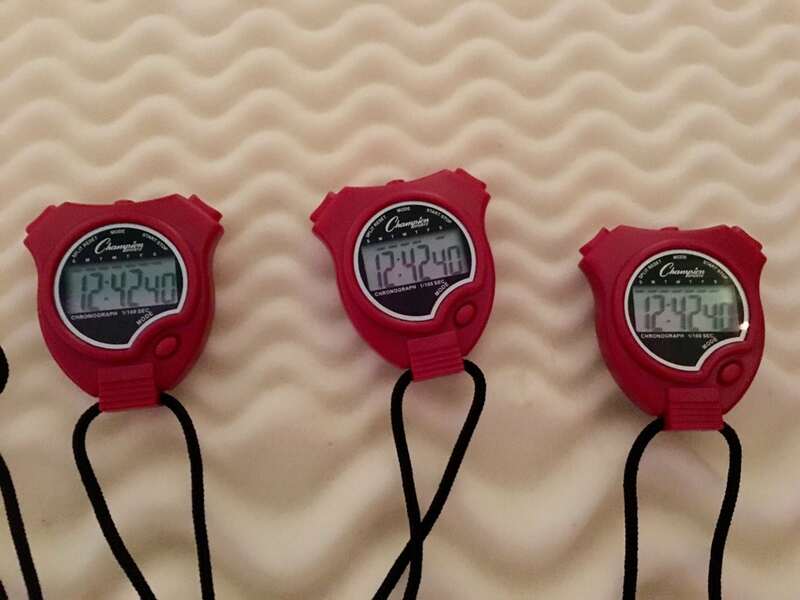 You have to have three back-up hand timers. You have to have a USADA doping person fly in to drug test me. They had to have extra timing mats. We had to make sure they had all the criteria covered to make it count. We pulled it off. Holy cow! I can’t believe it happened. I felt like I needed redemption. I’ve been fit all these months since Comrades, but I’ve just had so many freaky things happen. I wanted to be given a chance to run and keep going and persevere. That’s what I do. I just keep going and keep pushing. 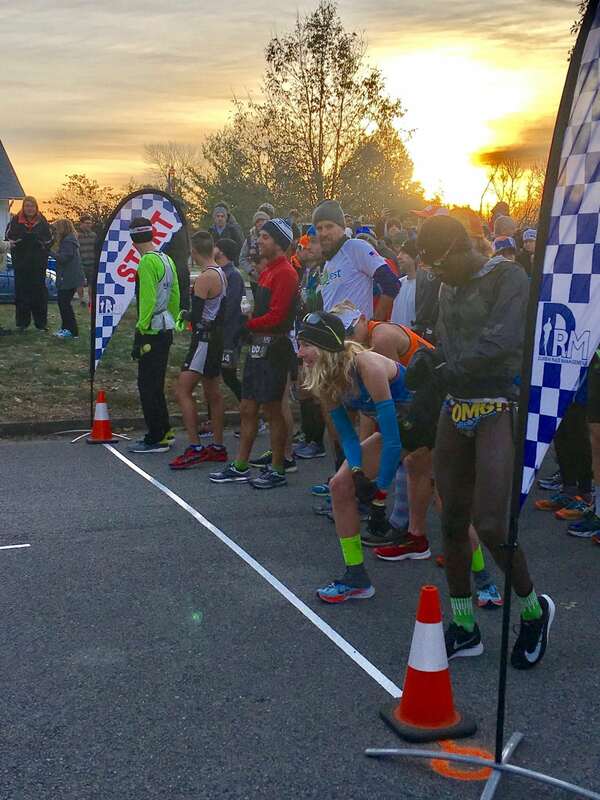 iRunFar: You touched on the unique situation at Tunnel Hill in that technically, the surface is not a paved surface, and yet it is a USATF-certified road course. Can you lay out what the race is like and what the surface is like and explain the conditions you were in? Herron: Totally. Because it’s a rails-to-trails course, it’s dirt and crushed limestone. Because it’s rails-to-trails, it has borders to it, so it’s a ‘trail,’ but it’s basically like a crushed limestone road. They’re able to USATF certify it—it also has the IAAF certification—because if it was like most trails, to certify it they’d have to use cones to create borders so you can’t cut the course. You can’t cut this course because it’s a rails-to-trails, so it’s a straight shot. It’s not possible. iRunFar: The 100-mile course is a series of out-and-backs along the rails-to-trails trail? Herron: Yeah, it’s tree-lined and packed with leaves and tree debris. It’s the first time I’ve ever worn gaiters on my feet, and I’m really glad I did that, because we were picking up all the leaves, and I was trying not to step on tree branches. I had to watch my step. It’s reasonably flat. I don’t know what the elevation gain is, but it was a flat rails-to-trails covered with a lot of leaves. They tried to use a leaf blower to blow out parts of the trail, so there were parts that were more crushed limestone, but there were long sections that were just packed-down leaves. You can look at my splits and see where I slowed down where all the leaves were, but when I got on the hard-packed crushed limestone, then I could pick it up. It was a pastoral setting. It’s really pretty. For a rails-to-trails-type course like that, it was really pleasant running. We headed south 13 miles and then turned around and come back north. We overlapped with other runners—they had a 50 mile and a 100 mile. That was really cool. I really liked seeing the other runners. We had to turn around and go back north about 26 miles. Then you get to the north section where there’s this tunnel. It’s probably 300 meters long, and it’s dark in there. It was really cool. You’re anticipating—Oh, I’m going to go through the tunnel. You have to run for a ways, and then you hit this tunnel, and then you come out the other side and go two miles beyond that. Then you turn around and come back. The most daunting part of it is that that’s the 50-mile course, and then you have to repeat it. You complete the whole course, and then you have to repeat it. Oh, man, I have to do that all over again. You have sun going down in the trees, and you’re thinking, Oh, it’s going to get dark soon. iRunFar: I want to ask about your pacing. Your ultimate pace-per-mile was a 7:37 or 7:38. You started out pretty steady, at least according to the timing mats, like in the 7:15 to 7:20 range. Was that intentional? How did that play out? Herron: What I had in my head from practice was going 75% of my heart-rate max. That’s an easy to steady long-run pace. I practiced it on road, and I was hitting 7:10 to 7:30 pace. I wasn’t really sure what it was going to be on trail, but I thought it might be 20 seconds per mile slower. I was able to start the race at that pace. We didn’t have mile markers, so I didn’t know my pace. I was trying to go by effort. I felt like I was able to start out at my road effort. With it being on trail, I didn’t think it was as quick as if it had been a road or bike path. I’d read the archives of UltraRunning Magazine because I wanted to hear Ann Trason’s thoughts from when she went for the record, and she actually thought 12:10 was possible for a woman. I thought that maybe 12:20 was possible. I had in my head that being on trail, if I hit between 12:20 and 13:00, I’d be ecstatic. 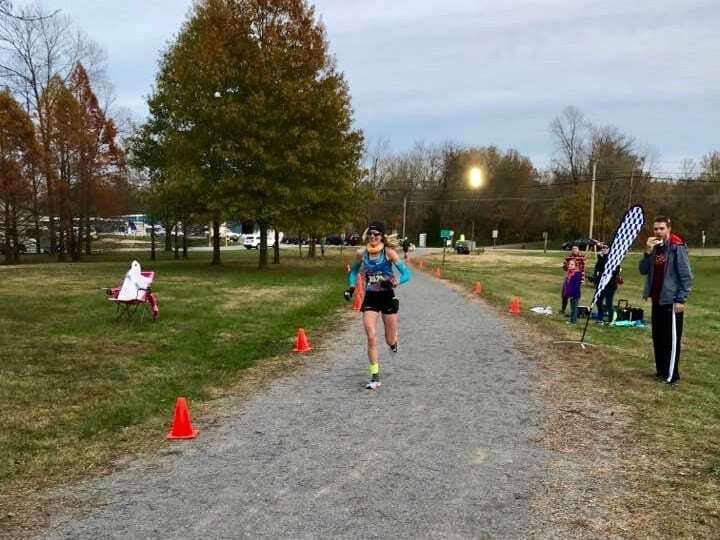 I felt like I was able to start off at what my road effort would be but because it was on trail, I couldn’t spring off the ground like I would in a road race. I feel like it could be faster on a road or track. iRunFar: This is 100 miles. This is your first time finishing 100 miles. Without the knowledge of what 70, 80, 90 miles on your legs feels like, how were you able to set that in your head that you could do between 12:20 and 13 hours? Yeah, you can do long training runs, but how do you extrapolate that forward in thinking, I haven’t finished 100 miles, but I think it’ll go like this? Herron: I kept thinking about the idea that 100 miles is so much more than the feedback of your heart. You have to troubleshoot your stomach and your feet and going to the restroom and all these other things. So my pace slowed down, but at the same time I felt like the entire day we were just troubleshooting constantly. I feel like I need more calories. I need to switch my sports drink. I was thinking about how I felt and what I needed to change. I dropped things during the race and had to stop and pick them up. Oh, I don’t know if I can get back up. Then it got dark. Once it got dark, even though I had my headlamp on, I naturally slowed down. It felt like I was going quicker than I was. I’d see the forest and really think I was pushing it, but I had slowed down. I’d watched a documentary on Yiannis Kouros. He talked about how the further you go, you have to constantly keep finding inspiration. Mentally, I was going further than I ever had gone, and I had to constantly find inspiration. I tried dissociating from how I was feeling and started thinking about workouts and how I felt and how I had to keep pushing. The entire race, I had a lot of mental inspiration. I had some friends who have a daughter with a lot of health issues this past week. She’s in critical condition. I was really thinking about her and how I wanted to do something special for her. I saw Harvey Lewis who is a 24-hour runner. He was out there racing the 50 miler, and he was reminding me to stretch my legs every so often. I was reminding myself to pick up my legs and pick up my knees so they wouldn’t keep cramping on me. I felt like the entire race was these mental things where I was trying to stay positive and keep smiling and just enjoy the experience. One thing that was key, halfway though the race I started feeling like I needed more calories. I felt like I was going through this energy swing. I normally have a good gut and pretty good energy, but I was going through these swings. I switched my sports drink from Gatorade Endurance Formula—I’ve used it for 10 years but they’ve changed the formula—to Maurten. It’s the drink they used in the Breaking2 project. It’s a special hydrogel. It’s a really concentrated sugar, and it forms a gel in your stomach. I had practiced a bit with that. Man, that stuff was like rocket fuel. I felt so much better. I was still taking my gels, but I stopped feeling hungry. So, I was getting an extra 20 grams of carbs per hour on top of the gels I was taking. You’re supposed to get between 60 and 90 grams of carbs per hour. I was probably doing more like 60 grams the first part of the race, but I bumped it up to 80 to 90 grams of carbs per hour. I felt so much better. It was cool that the whole race was troubleshooting things like that. That was the really fun part—being able to read my body and fix something if I wasn’t feeling right. iRunFar: Leave it to the Irish guy to make sure you drink some beer. Herron: I didn’t feel like I needed it. I do hot races where I crave beer, but I was kind of cold. I feel like I could have gotten through the race without drinking a beer, but it was nice to stop and guzzle a beer really fast and keep going. It was probably about 80 miles into the race where I had my first beer. I lost some time in the end with stopping and having a beer in the dark, but I had enough time to play with, I knew I was going to be okay. The beer was a nice treat. iRunFar: You should run a beer mile and see how that turns out. Herron: Oh, man, I don’t know. That’s a whole other level. They’re sprinting. I don’t even know how to do that. Those women are doing a 6:00-minute mile or something like that chugging four beers? iRunFar: On the other hand, many people are challenged by getting the volume down while running, and you don’t have any problem with that. Herron: I’ve heard there’s a vertical beer mile in the Colorado Front Range that some of my friends are trying to get me to do. iRunFar: “What could go wrong?” My last question for you is about the future. You’ve had quite a year with some highs and lows. What have you learned? What are you taking with you in 2018? What are you going to try for next year? Herron: After what I’ve been through this year—I’ve torn my MCL; I’ve had a concussion; I’ve hurt my hamstring; I hurt my back or my hip or pinched a nerve. I’ve had so many injuries. I got back to my original goals when getting into ultrarunning—I wanted to go after all these world records. I need to build myself back into getting my legs fast again. Next year, my goal is to go for the double again, to try and win Comrades and Western States. I still feel like that’s my ultimate lifetime goal. I still feel determined to try and get redemption at Western States. It took Ann Trason a couple times at Comrades and Western States to get it right. I’m still learning how to do this. I’ve learned a lot about my own limits. Just the fact I’ve learned what terrain is my kryptonite. I’m hoping to work with Nike on trying to develop this shoe to get me to stick better when it’s wet. I know I can climb. I’ve done fine when the courses have been dry. I’ve been able to climb well and descend and go over technical terrain. I know I can do it, but how do you get me to stick? I haven’t given up for sure. I definitely want to get my fast legs back and go for the 100k American record by Ann Trason, which is seven hours. That’s probably the toughest record, the seven-hour mark for the 100k. The [IAU 100k] World Championships are next September. If I can get my road legs back for Comrades and Western States and then stay healthy and keep the momentum going toward the 100k, those would be my three main goals for the year. I also want to go back to Tarawera. They’re going to have a 100 miler next year. I had so much fun with the 100k course that I would really like to do it. Those are my main goals, and then I’ll try to fit in other appropriate goals in between. I love the faster trail courses like American River 50 Mile. I want to do JFK 50 Mile. I’d love to do The North Face 50 Mile. I think next year I just want to concentrate on running fast and going after those faster, tougher records. I think my number-one goal next year should be to be healthy. If I can stay healthy and train consistently, then I feel the sky is the limit on what I can do. Even with this record, I had two-plus months of fairly consistent training, but that’s only two months. What if I string together four or six months? iRunFar: Thank you so much for your time today. 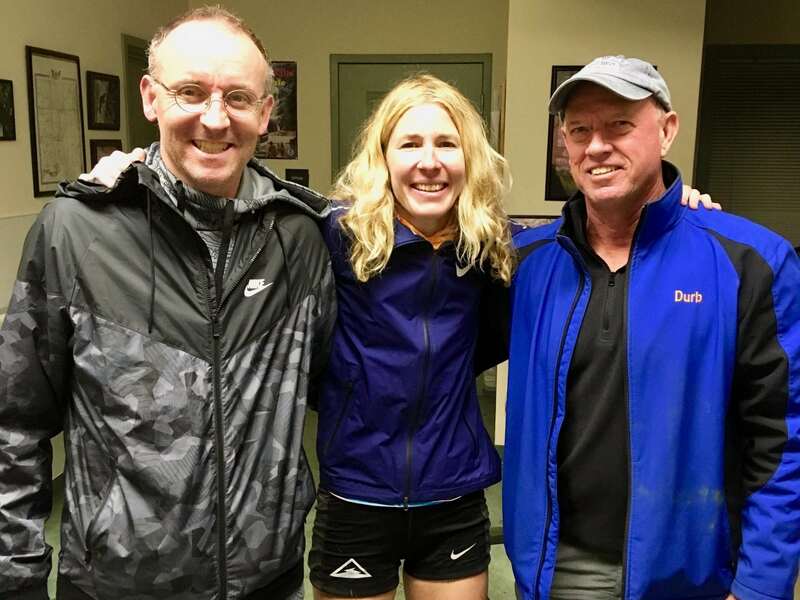 Camille Herron with Tunnel Hill race director Steve Durban (right) and husband Conor Holt. Photo courtesy of Conor Holt. I think nobody else even comes close. I wonder how UROY will factor in DNFs because Camille certainly had a great year in the races she finished but also had a few high-profile DNFs too. Have we seen a resume like hers before (great wins & times + DNFs) win UROY before? I wonder why Camille proactively brought up the “you can’t cut the course” in response to a question that really wasn’t asking about it necessarily. Any additional context for that Meghan or Camille? There was some confusion about the USATF certification. Surface doesn’t really matter, the ability to measure the course and have clear boundaries to demarcate the shortest possible route do matter. Camille was responding to the question about how the course is USATF certified but there was confusion because surface doesn’t matter (though the question implied it did), just clear boundaries–hence the importance not being able to cut the course for USATF certification. Way to go, Camille! I do like Nike’s trail shoes (both Kigers and Wildhorses) and I know Nike is Camille’s sponsor but their ‘sticky rubber’ is not very grippy on hard surfaces when it’s wet (I’m putting it mildly here). Vibram’s compounds (as found under Salomon’s shoes in example) really seem better, at least to me they do. They could improve there, and that might benefit all users, and give Camille a shot at the races that did not work out. Keep it up! Congratulations, Camille! Amazing stuff. I’ll eat some ice-cream in honor of the calories you burned during the race. Awesome achievement! I’m proud you. As a fellow Oklahoman I know it’s not easy to train around here for ultra marathons. There are few of us from here but ultra running has strange Oklahoma ties throughout the world. Keep reppin’ the state Camille and make all of us proud. Boomer! Excellent interview and a mind-boggling performance … but the second photo of the dude in the OMG bun huggers takes the cake! Exactly. Since when are banana hammocks trending? Nothing says “crisp morning” better than gloves, beanie and a speedo. The Todd would be so proud.. When you can run 50 miles in 5:30, you can wear anything you want and it will be trending! Sarah, that’s Coree Woltering, who won the Tunnel Hill 50 last year and has been a past interviewee on the podcast you host sometimes. Awesome! So, so awesome. Huge congratulations to Camille on an incredible accomplishment. Does anyone know what shoes Camille was wearing? I would like to hope that Nike hooked her up with the Vapor Fly Elite. 4% improvement could actually be good for more than 4% at ultra distances on a smooth trail. Camille is an athlete of a unbelievable caliber, but she clearly had the hydration/fueling and shoes dialed for this race. Has anyone tried the $250 vapor fly 4% on trails? I imagine durability and grip are not good, but I bet they are super fast. According to runner’s world: “A gift from her sponsor, Nike, also gave her a boost—a new pair of the hyped Zoom Vaporfly 4%. It’s the same shoe Eliud Kipchoge wore in the Breaking2 experiment, when he ran 26.2 miles in 2:00:25, and what Shalane Flanagan wore on November 5 for her New York City Marathon victory.“I think this is the first world record set in the shoes, though,” Herron said.” Not sure if they were the elite or the regular ones. I’d love to hear how the shoes worked for her too. For the recorded they are regular 4%. Not the elites. You should be so proud of yourself and your team, Camille. Great job!